An unassuming option can change the way you think about mobile technology -- but only if you see it for its full potential. Project Fi isn't your average mobile phone carrier. That much was clear from the second I signed up for the service last fall. And now, after having personally used Fi for the better part of a year, I'm finding new ways it can make my life easier. Project Fi, if you aren't familiar, is Google's experimental wireless service for its own Nexus devices. It seamlessly switches your phone between a handful of networks -- Sprint, T-Mobile, and as of recently, U.S. Cellular -- to get you the best possible signal at any given time. It also taps into reliable public Wi-Fi networks (with its own layer of encryption in place) and uses those for your calls and data whenever it can. You pay only for the data you use each month -- at the same flat rate, even if you're roaming in a different country. It's an unusual arrangement that won't make sense for everyone, but if you're anything like me and my family, it could end up saving you some serious moolah. But hold the phone: There's more to Fi than just those basic benefits. Late last year, Google added an option for Fi subscribers to get data-only SIM cards that are tied to existing accounts. The idea is that you can pop a card into any SIM-supporting laptop or tablet and then get that device online at your same regular data rate, without any extra fees or complications. When I first heard about it, I thought: "Hey, that's cool -- but I probably wouldn't use a feature like that very often." After all, laptops and tablets with SIM slots are relatively rare. And even if I had such a gadget in front of me, there just aren't a heck of a lot of situations in my day-to-day life where I need a large device with its own dedicated data connection. But then something struck me: Tablets and laptops aren't the only places where an option like this could be utilized. This feature's real value lies in something far broader and more useful -- something for which it isn't overtly advertised. The inspiration hit whilst I was in the midst of a two-part experiment: one, spending a few days using my old 2013 phone for perspective, and two, thinking about ways I could use the word "whilst" in casual conversation. My old 2013 phone was the first-gen Moto X -- a device that's tiny by today's standards. In a lot of ways, I found returning to a phone of that size to be incredibly refreshing; while I generally enjoy my Nexus 6P, the truth is that it's always been a bit larger than I'd like. Particularly for times when I'm doing something active, it's just more bulk than I want in my pocket. Suddenly, a light bulb appeared over my head. After carefully taking it down (a floating glass bulb -- talk about a safety hazard! ), I started thinking about the notion of using a smaller, older phone as a supplement to my 6P -- a surrogate smartphone, so to speak. If my dusty old device could somehow be tied to my regular cell number and service, I could grab it without any effort and stay connected while leaving my regular phone at home. Sure, I could move my main SIM card from one device to another when I want to make such a shift, but let's be honest: That's just enough of a pain in the ash that I wouldn't bother doing it after a while. But alas: I don't have to. And as it turns out, my surrogate smartphone scenario is just the tip of the iceberg. I'd actually stumbled onto something far more significant and versatile than I'd ever imagined. You see where this is going, right? Whilst (!) thinking about the possibilities, my rapidly decaying brain somehow remembered Project Fi's data-only SIM option. "Wait a second," I said to myself. "That option may have been designed for tablets and laptops, but there's no reason it wouldn't work just as well with phones." "Good point, jerkface. Now stop talking to yourself," I responded with a swift kick to the fibula. Once my internal quarreling subsided, I signed into the Fi website and placed an order for a data-only SIM card (for a grand total of $0 plus $0 shipping -- a price I can almost afford). And then I got to thinking about all the ways that little piece of plastic could come in handy. 1. You could use the same setup to create a functional phone for a kid -- without having to pay for an extra line. Provided you have an old Android phone sitting around -- or are willing to buy a cheap budget phone to fill that role -- just toss the Fi data SIM in, set the phone up for your youngin, and cackle at your cash-saving cleverness. Whether your offspring is using the phone here and there for "educational" game-playing and video-watching or taking it out and about to stay in touch from afar, it's an easy way to keep your kiddo connected on occasion without having to start up a new account and deal with all the accompanying ongoing fees. Just be sure to see below for an important asterisk about the phone's call-making capabilities. 2. You could use it to have a ready-to-go backup phone in case your primary device (or your significant other's) is ever missing, broken, or low on battery. There's nothing saying your surrogate smartphone has to be destined for any specific people or activities; you could just as easily keep it sitting around and ready to step in whenever the need arises. Think of it like a spare tire, only without any jacks or wrenches required. 3. You could use it to create a dedicated hotspot that'll beam out mobile data access without draining your primary phone's power. Pop the SIM into any T-Mo-compatible phone -- or, heck, even a standalone hotspot device, if you want -- and fire it up without having to worry about running down your own phone's battery. "Ah, but wait! 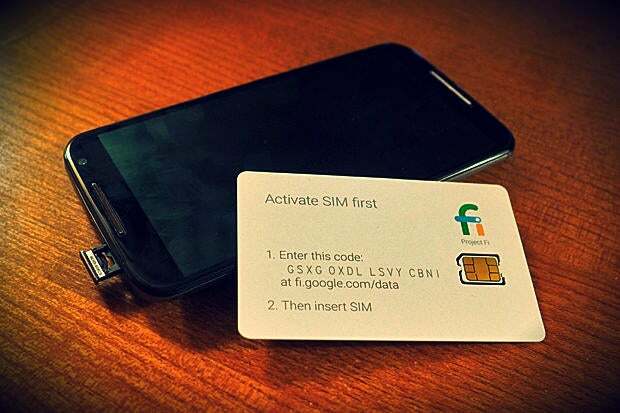 A data-only SIM won't let you make and receive calls, will it?" Technically, no (and thanks for the timely interjection!) -- but fear not, my friend, for all you need is the free Google Hangouts Dialer app to get around that restriction. Hangouts Dialer makes it possible to place and receive calls from your regular Fi number; it just uses data instead of regular cellular minutes. As long as you have a solid connection, be it via mobile data or Wi-Fi, using Hangouts Dialer for phone calls should work flawlessly. I've been using the app to make calls in the car from my "data-only" surrogate smartphone, and people have actually remarked that the call quality sounds noticeably better than normal. If you want to get really crazy, you can also use Hangouts Dialer to place and receive calls from an alternate number -- even while you're actively signed into the device. All you have to do is set up the free Google Voice service on a secondary Google account, then add that account onto the phone. Find that account in the settings section of the Hangouts Dialer app and just make sure the option for it to receive incoming calls is checked and active. To place a call from that other number, open up Hangouts Dialer, tap the menu icon in the upper-left corner, and tap the circular avatar corresponding with the account you want. Any calls you place in Hangouts Dialer will now come from that account's associated number. Again, it's worth emphasizing: Regardless of how many SIM cards you get or what you do with your secondary device(s), all you'll pay for is any mobile data used in any given month -- just like you do now on your primary Fi phone. Using mobile data across multiple phones is effectively the same as using that same amount of data on a single device. The only difference is the added convenience and versatility -- and I don't know about you, but that's something I'll happily accept.